I was talking to my Dad last week and he reminded me that it was seven years ago that day that my Mom had been diagnosed with breast cancer. Until that recent phone conversation, Iâ€™d never made the connection between that event and the fact that October is breast cancer awareness month. As if there hadn’t been enough going on three weeks after 9/11, I now certainly had plenty to keep me up at night. Fast forward seven years and things are going well with my Mom. Although sheâ€™s never fully regained all of her energy since the treatments, overall she is back to being herself and has been for years now. When all this came about, I was very grateful for having spent so many years in the US and how illness (or at least some types by now) is treated here versus many other countries, like Hungary, where my Momâ€™s diagnosis occurred. In too many cultures and communities, illness of all kinds remains a taboo. Not only is it not okay to tell people about it, often doctors won’t even tell patients their diagnosis. While awareness programs may seem superfluous to some*, it is important to remember that in many communities it is not only not the standard to talk and think about illnesses (and thus, for example, take preventive measures when possible), but it is a topic to be avoided outright due to associated embarrassment. What struck me as I was talking to friends about my mother’s situation was how many among them had a close family member or friend who’d also had breast cancer. It was very helpful to hear about related experiences. But were it a taboo to discuss issues of this sort, I would have been left on my own to deal with the difficult news. Point being, there is value in talking about things of this sort at various levels: from contributing to prevention efforts to the emotional support that can come of it. Recently, I received some notices about interesting pink-themed undertakings going on right now. 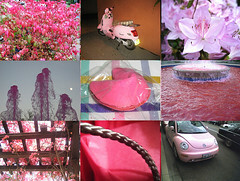 One is a Pink group on the photo-sharing site Flickr that seems to be raising money for breast cancer awareness in various European countries. Another is an innovative idea by sociologist Dan Myers who has decided to wear pink every day for the month of October to raise awareness and collect donations. Support him if you can. Of course, there are serious critical ways of looking at the pink ribbon campaign. For a couple of years now, Iâ€™ve had the book Pink Ribbons, Inc. on my book shelf, but havenâ€™t gotten around to it yet. Has anyone read it? I’ve been thinking about a way to contribute to these efforts myself this year and I have an idea. I’m putting some finishing touches on it. I’ll post about it in a bit. [*] A few months after my Momâ€™s diagnosis, I still remember that there was an article in The Daily Princetonian making fun of the ribbon campaign. Like I have done above, a response to that piece tried to explain why these do serve a purpose. This entry was posted on Saturday, October 11th, 2008 at 12:39 pm	and is filed under Health & Fitness, Soc/Pol/Econ. You can follow any responses to this entry through the RSS 2.0 feed. Both comments and pings are currently closed. Thank you for pointing out that “awareness” outside the U.S. works differently! I find that helpful. For me, here, “raise awareness” has become more of a cynical marketing device than a useful health movement. “Raise awareness” is what corporations say about a pink or pink-ribboned item when they want to sell it to the breast cancer community but they don’t intend to give a dime to a breast cancer program. And, I definitely personally know people who are more interested in collecting pink tchotchkes than in actual health, including their own. It’s as though pink ribbons have taken on a life of their own, orthogonal to the issue that inspired them.